The Prep Wife: I'm THAT girl! I confess! I am the girl who will stop to pick up a quarter from the ground (usually when they are face up so that they're lucky ☺ ); the girl who will take not one but two (or even three) pieces of candy on the way out of a restaurant; the girl who eats samples at the supermarket then casually yet somewhat discretely takes a second piece if I like it; and the girl who signs up for contests all the time. Yes, I am THAT girl. That somewhat annoying girl. Let me tell you one thing though-- I am proud to be that girl! Because you know what? It paid off! Before you get excited, I should tell you what I won. I won a pair of tickets to the Elegant Wedding Show! I know it's nothing significant and I am sure many people who applied won tickets but it made me so happy! All I had to do is fill out a short participation form on Facebook and a few days later, I got the great news. If I try, I have nothing to lose; if I don't try, I have nothing to gain. I use those few words as a guide in many aspects of my life. I woke up yesterday to start a normal day and out of nowhere, I find out that my free tickets to the wedding show are on their way. How can an unexpected surprise like that not make anybody happy? 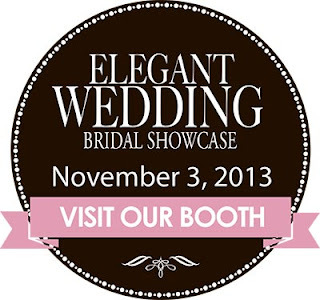 I will go to the Elegant Wedding Show and soak in all the beauty and innovative ideas. Just looking at the website is mesmerizing. You should all know that I am not a crazy bride-to-be. I do not only talk about weddings, flowers, tablecloth colors and wedding favors. I am a hopeless romantic and in love with love. Frankly, all those little details are secondary to me. The day I become "Mrs. Mr. A" will be a day to celebrate our love with our close family and friends. A wedding is a wedding, not a show. But of course, at the risk of sounding hypocritical, I still want a beautiful wedding. Despite what I just said, we are still getting married and cannot do so in an undecorated, empty room so I need to go to the Elegant Wedding Show for inspiration! A friendly warning to Mr. A (or to whoever is coming with me to this Wedding show): I will sign up for even more contests and will sneak extra cake samples☺! 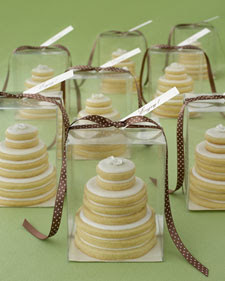 Here is Martha Stewart's recipe of adorable wedding cake cookies. I love how delicate and precious these look. Bake until edges turn golden, 15 to 18 minutes. Transfer cookies to racks; let cool completely. Transfer icing to a pastry bag fitted with a small plain round tip. Pipe around top edges of each cookie, about 1/4 inch from edge; fill in with a thin layer of icing. Smooth with a small offset spatula. (Reserve about 1/4 cup icing for assembling cookie cakes.) Let set, at least 6 hours (or overnight).